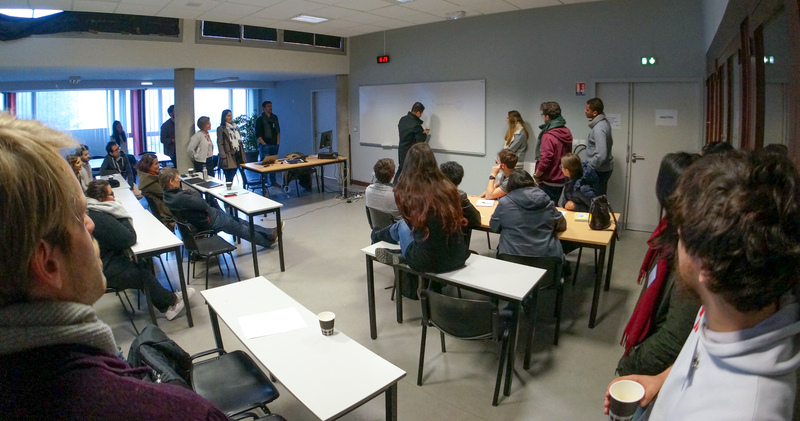 January 25, NeuroSchool PhD Program welcomed first-year PhD students during the Welcome Day, a dedicated afternoon to help them meet each other and transmit crucial information about their upcoming years at Aix-Marseille University. Can you meet peers through drawings? How can dozens of people, from all sort of academical and cultural backgrounds, meet and get to know each other? Have them play Pictionary about their research! During an ice-breaking game, PhD students had to gather in small groups by finding a common point among their PhD topics (neural hyper-excitability, clinical applications, computational neuroscience, etc.) then make other teams guess it using only drawings! A great opportunity to meet fellow students working in a similar field and to cultivate professional and personal networks! The PhD Program Welcome Day also allows last-year organizing committee of the PhD Days to meet incoming PhD students, introduce the event and recruit the most motivated ones to constitute the next committee. What are the PhD Days? Each year, NeuroSchool PhD students organize conferences, meetings, debates for scientific and non-scientific audience in a fun and interactive way. The PhD Days allows them to organize a scientific event from scratch, including inviting international speakers, welcoming participants or even managing a communication campaign. A unique opportunity to develop professional skills, to grow their professional network and to make their first steps in the scientific popularization field. Read more about the 2018 PhD Days about perception bias and disturbances induced by technologies, drugs, disorders and even magic, here. In 2019, the NeuroSchool PhD Program welcomed 41 PhD students.